Thus writes young Karl von Gebler, in the best life of Galileo ever written, his dying contribution to literature. 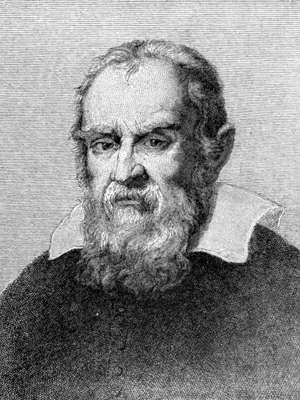 Some other authorities place Galileo’s birth on February 15. He was the oldest in a family of five children born to Vincenzo Galilei, a Florentine noble, and Giulia Ammanati, who also belonged to an ancient family. Vincenzo wrote learnedly about music, and taught his boy to play on the lute and the organ; but he was poor and life was a struggle. However beneficial poverty may be in the development of character, most of us do not crave it for our children, so Vincenzo decided to place his son where he could earn a comfortable support. Music did not bring money. Galileo therefore should [p.2] become a dealer in cloth; a necessity of life, rather than a luxury. But the boy soon showed great skill in music, surpassing his father. He excelled in drawing and color, and could have become a noted artist. He loved poetry, and had a decided taste for mechanics, making machines of great ingenuity. It soon became evident that such a lad would not be satisfied to spend his life trading in wool. He must be educated, but how? The family had moved from Pisa, where there were schools of repute, to Florence. An effort had to be made, by the greatest economy, to prepare Galileo to go back to the Pisan University. He showed great aptitude for Latin and Greek, and at seventeen was ready for Pisa. For what profession should he study? Not what best suited his tastes, but that in which his father thought he could make money, medicine. Poor Vincenzo! who can blame him that he hated poverty for his brilliant son? At college, Galileo became an ardent student of philosophy, and because he dared to think for himself, and did not always agree with the teachings of Aristotle, he was called “the wrangler.” Until he was twenty he was scarcely acquainted with the rudiments of mathematics, because his father thought this study was a waste of time for a man who was to become a physician. How many parents make the mistake of bending their children to their own plans, instead of ascertaining what a [p.3] boy or girl can do best in the world, and then fitting him or her for it! While Galileo was studying medicine in Pisa, boarding with a relative, the court of Tuscany came to the city for a few months. Among the suite was Ostilio Ricci, a distinguished mathematician, and Governor of the Pages of the Grand Ducal Court. He was a friend of the Galilei family, and was pleased to see the bright young son, Galileo. When he taught Euclid, the medical student would stand shyly at the schoolroom door, and listen with intense interest. Soon he began to study mathematics secretly; then begged Ricci to teach him, who gladly consented, till the father forbade it, seeing that Euclid interfered with medicine. Meantime, the youth of nineteen, kneeling at prayers in the Pisa Cathedral, had dreamily watched a bronze lamp swinging from an arch. The oscillations were at first considerable, but as they grew less and less, Galileo observed that they were all performed in the same time, measuring the time by feeling his pulse. The idea occurred to him that an instrument could be constructed which should mark the rate and variation of the pulse. He began to experiment, and soon invented the pulselogia, which the physicians hailed with great delight. The pendulum was not applied to clocks till a half-century later, but its invention attracted the attention of all scholars. [p.4]After four years’ residence at Pisa, Vincenzo Galilei appealed to the reigning Grand Duke, Ferdinand de Medici, to grant to his son one of the forty free places founded for poor students, but the request was denied, and Galileo, unable to pay for his doctor’s degree, was obliged to leave the university without it. Already he had learned bitter lessons of privation and disappointment, but youth has a brave heart, and looks ever toward the sunlight. He went back to his home in Florence to study the works of Archimedes, whom he called his “master,” to write his first essay on his Hydrostatic Balance, and to earn the reputation of a bold inquirer in geometrical and mechanical speculations. The father had now given up all hope of a fortune coming through medicine! Henceforward, the genius which was to shed lustre on his own name, otherwise buried in obscurity, was to have its own bent, and work out its own destiny. If we are in earnest, a door opens sooner or later; but our own hands usually open it. At twenty-four a door opened to Galileo. Marquis Guidubaldo, a celebrated mathematician, appreciating what the young scientist had done, began a correspondence with him, and a valuable friendship resulted. The marquis asked him to study the position of the centre of gravity in solid bodies. Galileo applied himself to it, and wrote a valuable essay, which waited fifty years for publication. [p.5] Perhaps no person can be really great who has not learned patience, and Galileo had many lessons in this virtue before he died. Through the influence of the marquis, he was brought to the notice of Ferdinand I., reigning Grand Duke, who appointed him to the mathematical professorship at Pisa. This was a great honor for a young man of twenty-six, one who had been too poor to take his degree. The salary was small, less than a hundred dollars a year; but he earned somewhat by the practice of medicine, by lectures on Dante and other literary subjects, and by lessons to private pupils. Of course, he had little or no leisure; but he thus learned one of the most valuable lessons of life,—to treasure time as though it were gold. How glad his father and mother must have been that their wool projects had come to naught! The professors at Pisa, with a single exception, Jacopo Mazzoni, in the chair of philosophy, were opposed to the new-comer. They were all disciples of Aristotle, and had not Galileo, when a boy among them, dared to oppose the great Grecian? And now, to make matters worse, he had taken some friends to the top of the Leaning Tower, and had put to the test the belief of two thousand years,—that the rate at which a body falls depends upon its weight. When the different weights fell to the pavement at the foot of the Leaning Tower, at the same time, the learned were astonished. If Aristotle could be wrong in one [p.6] thing, he might in others, and this young man would revolutionize the teaching of the times! The feeling became so strong against the investigator that after three years at Pisa he resigned. When will the world learn toleration for those whose opinions are different from the popular thought? From Galileo to Darwin we have persecuted the men and women whose views were unlike our own in theology, in science, or in social matters. Through his friend, the Marquis Guidubaldo, the mathematical professorship at Padua was obtained for Galileo. He was now twenty-nine, and becoming widely known throughout Italy. His father had just died, leaving the whole family, a wife and four children, dependent upon him for support; not a small matter for an ambitious and hard-working professor. Padua gave the young man cordial welcome. Vincenzo Pinelli, a learned nobleman, who possessed eighty thousand volumes, mentioned him to Tycho Brahe, the great Danish astronomer, as a man whom it would be well to cultivate; but the Dane was too cautious about his own reputation, and did not write Galileo till eight years later, and died the following year. John Kepler, like Galileo, lived a pathetic life. His childhood was spent in the little beer-shop of his wretchedly poor father. At six he had a severe attack of small-pox, and his eyes were permanently weakened. He was put to the plough, but his delicate body could not bear the work. At last, through charity, he became a theological student at Tübingen. But here he began to think for himself, and, probably, would have been obliged to leave the university. Fortunately for science, he heard some lectures given by Michael Möstlen, famous in mathematics and astronomy. A new world opened to Kepler. He applied himself with all the ardor of youth, and at twenty-two became professor of mathematics at Grätz, in Styria. He was soon driven away from this Catholic stronghold, on account of his Protestant faith. Tycho Brahe heard of his needs, and made him his assistant at Prague, with a salary of seven hundred and fifty dollars a year. This [p.8] seemed regal splendor to the poor astronomer. Now he studied the heavens with hope and delight. Such was his joy when he discovered this law, after seventeen years of labor, that he said, “I have written my book. It will be read; whether in the present age or by posterity matters little. It can wait for its readers. Has not God waited six thousand years for one to contemplate his works?” In a last fruitless attempt to recover twenty-nine thousand florins, owed him by the government, worn out with want and disappointment, he fell ill and died at Ratisbon, leaving thirty-three works, twenty-two volumes in manuscript, and his family in the direst poverty. Such was the man who admired Galileo in his youth, and who stands with him in the admiration of the [p.9] generations that have come and gone since these two men lived and wrote and suffered. At Padua, Galileo soon attracted great numbers to his class-room. Often a thousand gathered to hear his lectures, and when the hall was too cramped, he spoke to the people in the open air. He was above the middle height, well proportioned, with cheerful countenance, witty in conversation, and enthusiastic in his manner. So learned that he could repeat by heart much of the works of Virgil, Ovid, Horace, and Seneca; he was yet modest and unassuming, saying that he never met a man so ignorant but that something might be learned from him. Livia, another sister, had become engaged to a Pisan gentleman, with the promise of a dowry of eighteen hundred ducats, eight hundred of which must be paid down. The “Pisan gentleman” could not burden himself with a wife, without funds to help support her and himself. So Galileo generously, if not wisely, borrowed six hundred ducats, and paid the necessary eight hundred, giving his sister beautiful clothes and house furnishings. Besides these sisters, Galileo had a lazy brother to provide for, Michelangelo, a young man of some [p.11] musical talent and elegant manners, with the not unusual gift of being able to spend much and earn little. Galileo obtained a situation for him with a Polish prince, and spent two hundred crowns in getting him ready for the new position. He went thither, but soon returned, and another place had to be procured for him, at the court of the Duke of Bavaria. “Many gentlemen and senators, even the oldest, have ascended at various times the highest bell-towers in Venice, to spy out ships at sea, making sail for the mouth of the harbor, and have seen them clearly, though without my telescope they would have been invisible for more than two hours. The effect of this instrument is to show an object at a distance of, say, fifty miles, as if it were but five miles off. [p.13]This must have been a comfort to the now famous Galileo, as it was, doubtless, to the useless Michelangelo, and the two brothers-in-law! He could now live in comparative peace and rest. On his return to Padua, he began eagerly to study the heavens. He found that the surface of the moon was mountainous; that the Milky Way was composed of an immense number of small stars and nebulous matter; that Orion, instead of being made up of seven heavenly bodies, had over five hundred stars; and that the Pleiades were not seven, but thirty-six. In January, 1610, he discovered the four moons of Jupiter, and that they revolved around him. July 25 of the same year, he discovered the ring of Saturn; in October, the phases of Venus, and later, the solar spots. Florence and Padua were in a blaze of excitement. These new discoveries seemed to prove that the earth was not the centre of the universe, but that Copernicus was right when he declared the sun to be the centre. Great opposition began to develop itself. Some of the Aristotelians declared that the telescope of Galileo showed things which do not exist. “It was ridiculous,” they said, “that four planets (Jupiter’s moons) were chasing each other around a large planet. “It is angels who make Saturn, Jupiter, the sun, etc., turn round. If the earth revolves, it must also have an angel in the centre to set it in motion; but if only devils live there, it would, [p.14] therefore, be a devil who would impart motion to the earth. “The planets, the sun, the fixed stars, all belong to one species; namely, that of stars—they, therefore, all move, or all stand still. With all this work in mind, he resigned the professorship at Padua, and removed to Florence, the Grand Duke Cosmo II. giving him a yearly salary of about one thousand dollars, and the title of Philosopher to His Highness. His first thought, as ever, was for his family. He asked an advance of two years’ salary, and paid the dowry debts of his sisters’ grasping husbands. In 1611, his expenses paid by the Grand Duke, he went to Rome to show his “celestial novelties,” as they were called, to the pope and the cardinals. He was received with great attention, and all seemed delighted to look upon the wonders of the heavens, provided always that nothing could be proved against the supposed assertion of the Bible that the earth did not move! However, in spite of Galileo’s logic, the church decreed that all books which stated the Copernican system as true should be prohibited; as a mathematical hypothesis, it might be speculated upon. This was a great disappointment to Galileo, who loved and revered the Roman Catholic faith. He went home to the Villa Segni, at Bellosguardo, [p.17] near Florence, and for seven years led a studious and secluded life. His greatest comfort, during these quiet years, was the devotion of his daughter, Polissena, who had entered a convent as Sister Maria Celeste. While in Padua, Galileo had three children by Marina Gamba, a Venetian woman of inferior station. She afterwards married a man of her own class, and Galileo took his children to his own home; a condition of things possible with the low moral standard of the time. The two daughters were placed in a convent, while the son, Vincenzo, was educated for the profession of medicine, but he seems to have been a disappointment and a source of discomfort. Again she writes, “I leave you to imagine how pleased I am to read the letters you constantly send me. Only to see how your love for me prompts you to let me know fully what favors you receive from these gentlemen is enough to fill me with joy. Nevertheless I feel it a little hard to hear that you [p.18] intend leaving home so soon, because I shall have to do without you, and for a long time too, if I am not mistaken. And your lordship may believe that I am speaking the truth when I say that except you there is not a creature who gives me any comfort. But I will not grieve at your departure because of this, for that would be to complain when you had cause for rejoicing. Therefore I too will rejoice, and continue to pray God to give you grace and health to make a prosperous journey, so that you may return satisfied, and live long and happily, all which, I trust, will come to pass by God’s help. And so the seven years of study went by, with the sweet love of Maria Celeste to brighten them. [p.19] There are none so great that they can live without affection. At Easter, 1624, Galileo, now sixty years old, resolved to proceed to Rome, to welcome the new pope, and urge his approval of the Copernican theory. Frail in health, he was carried most of the way in a litter. During a visit of six weeks, he had six long audiences with Urban VIII. ; but, though he was affably received, the pope was in no wise convinced, but rather tried to convince Galileo that he was in error. Yet so kind was he that Galileo went back to Florence with the hope and belief that he could bring out his great work, “Dialogues on the Two Principal Systems of the World, the Ptolemaic and Copernican,” without opposition from the church. [p.20] In this book, Galileo gave the results of scientific research and discovery in the half century preceding, using such clear yet brilliant style in writing as to make the work attractive even to the unlearned. It was ready for publication in March, 1630, but to be sure that the pope did not object, Galileo was urged to go in person to Rome. He went and presented the matter to Urban, who gave his consent provided that the title should show that the Copernican system was treated as a hypothesis merely, and that he, the pope, should write the closing argument. Rather than forego the publication of that upon which he had worked for years, Galileo consented, and returned to Florence. A license to publish was then obtained from the Inquisitor-General, and the Vicar-General of Florence, after great delay. A second and a third time the papal authorities wished to look over the manuscript. Two years went slowly by. [p.21] Galileo’s son Vincenzo had married and brought his wife home to live. Strange fortune for this man of genius! Strange that he must have helpless relatives, and constant pecuniary troubles. Most great lives are as pathetic as they are great. Finally Galileo moved to Arcetri, over against the convent, to be near the one who alone satisfied his heart. In January, 1632, the “Dialogues” appeared. Copies were sent to his friends and disciples throughout Italy. The whole country applauded, and at last Galileo seemed to have won the homage he had so long deserved. But a storm was gathering. Enemies were at work prejudicing the mind of Urban VIII., making him feel that Galileo had wrought evil to the church. At once an order came from the Inquisition to secure every copy in the booksellers’ shops throughout Italy, and to forward all copies to Rome. In October of the same year of publication, [p.22] Galileo was summoned to appear at Rome, to answer to that terror of past centuries, the charge of heresy. His friends urged that he was old and feeble, and that he would die on the journey, but Urban’s commands were peremptory. On January 20, 1633, the decrepit old man set out in a litter for Rome, arriving on February 13. On April 12, he was brought before the Inquisition, and briefly examined and then remanded to prison, though treated with great leniency. The anxiety and deprivation from outdoor exercise brought on illness, and he was confined to his bed till led a second time before the Inquisition, April 30. Weak, aged, in fear of torture, he made the melancholy confession that his “error had been one of vainglorious ambition, and pure ignorance and inadvertence.” Pure ignorance! from the man who had studied for fifty years all that the world knew of science! But he recalled how men had died at the stake for offending the church. The [p.23] world is not full of men and women who can suffer death for their convictions, however much we may admire such courage. On May 10, he was summoned a third time before the Inquisition, and told that he had eight days in which to write his defence. In touching language he stated how the book had been examined and re examined by the authorities, so that there might be nothing heterodox in it; and then he urged them to consider his age and feeble health. And then June 22, in the forenoon, in the large hall of the Dominican Convent of St. Maria sopra la Minerva, in the presence of cardinals and prelates, he heard his sentence. “The proposition that the sun is the centre of the world and does not move from its place is absurd, and false philosophically, and formally heretical, because it is expressly contrary to the Holy Scripture. Pitiful spectacle of intolerance! If we of this nineteenth century have learned to tolerate and treat with respect the beliefs of others though [p.25] widely divergent from our own, perhaps this wretched drama was not acted in vain. It has been said that Galileo exclaimed as he rose from his feet, “E pur si muove,” “It moves, for all that,” but this would have been well nigh an impossibility, in the midst of men who would instantly have taken him to a dungeon, and the story is no longer believed. He went to work on another book, but he said, pathetically, “I hear her constantly calling me!” Beautiful spirit, that will forever shed a halo around the name of Galileo Galilei! In the summer of 1636, he completed his [p.26] “Dialogues on Motion,” and sent it to Leyden for publication. The next year he made his last discovery, known as the moon’s librations. He had planned other work, but death came on the evening of January 8, 1642, eight years after Celeste left him. His beloved pupils, Torricelli and Viviani, and his son Vincenzo, stood by his bedside. 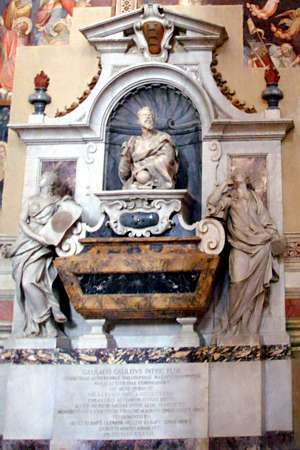 He desired to be buried in the family vault of [p.27] the Galilei in Santa Croce, at Florence, and the city at once voted a public funeral and three thousand crowns for a marble mausoleum. But the church at Rome prevented, lest the pernicious doctrine that the earth moves, should thereby have confirmation. He was therefore buried in an obscure corner of Del Noviziato, a side chapel of Santa Croce. A century later, March 12, 1737, in the presence of the learned men of Italy, with great ceremony, the bones of Galileo were removed to a new resting-place in Santa Croce, and buried with his beloved friend, Viviani. An imposing monument was erected over him. The truth finally triumphed, as it always does. 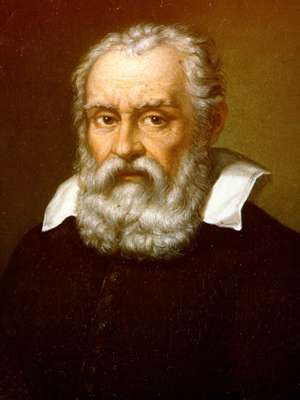 The works of Galileo, in sixteen volumes, are no longer prohibited, as they were in his lifetime.